The International 7 has come and gone, crowning a new victor in Team Liquid along the way. Whether you were on the ground in Seattle at the Key Arena or watching from home, there were plenty of sights and sounds to take in, as well as a few good signs. The Juggernaut statue overlooked one of the main entrances, and stood as a landmark of sorts throughout the week for attendees. You’ve got to wonder where Valve stores this thing the other 51 weeks of the year, though. Inside, attendees were greeted by a large whiteboard wall and markers, where they could leave mementos, trash talk, art, or just some good memes. But the main event was inside the arena, where thousands of fans gathered to watch the matches. It’s a little hard to get this through either the stream or a picture, but we captured the crowd reaction to some of the bigger moments on video, like the end of a 103:34-minute match. The holograms were pretty incredible too, though only viewable on the stream and in-house program feed. The crowd cheered loud when, after the two new Dota 2 heroes were unveiled, they appeared as on-stage holograms. 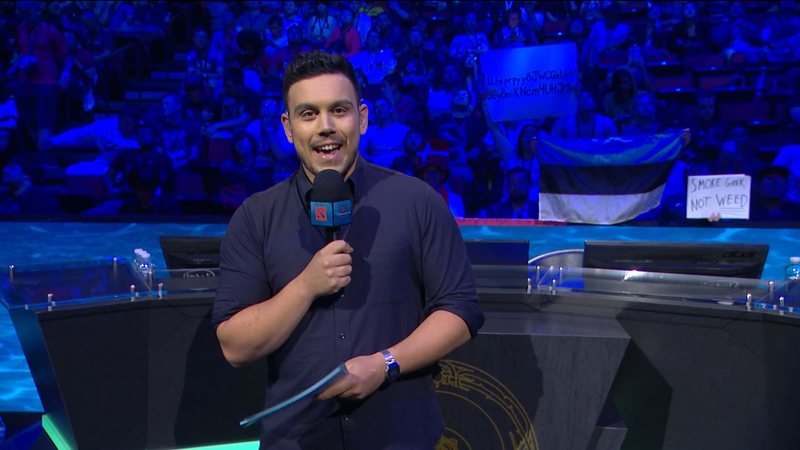 Signs are somewhat of an esports tradition, peppering the crowd with memes and real-life chat emotes. One fan took his love of the Russian ‘bears’ to another level, toting a sign and cosplay to support his homeland. There was “Smoke Gank Not Weed,” an anti-drug message encouraging supports to actually, you know, buy Smoke of Deceit and use it. The most popular, though, was definitely one calling attention to the fact that the US fans were putting their hopes and dreams onto Team Liquid, a Western team at heart but made up of multiple nationalities. If viewers ever got tired of the arena, or if they only had passes for the midweek games but not the finals, the outdoor stage was open for viewing. It was a beautiful week in Seattle (most of the smoke was clearing away) and there were food trucks and a beer garden nearby. Not a bad way to watch some Dota 2. Of course, the big moment was Team Liquid’s victory on the last day, a spectacular sweep viewed by 4.7 million and closed out with some pretty big pyro. Our view of it was great, if not a little closer than we would have liked. Eventually the house lights went up, the confetti stopped raining down, and everyone had to go home. The International is a real spectacle, made for Dota 2 fans and players to celebrate and host the best of their game. A LAN center nearby operated at all hours of the night and day to keep the games rolling, and random fans were always willing to strike up a conversation about how bad Winter Wyvern is. Now everyone will head back to their hometown and start speculating on roster shuffles and when the new patch might hit. Until the next major, it’s time for the Dota 2 scene to take a note from the adorable Dotakins that were given out and take a breather.